Photography by MM Michele Del Guercio. Reproduced by permission. gynecologic surgery results in better exposure to the operating field and improved wound healing. According to the American Academy of Plastic Surgeons, in 2001 there were approximately 58,567 abdominoplasties performed in the United States, relating to 4% of all plastic surgery patients and less than 0.5% of all plastic surgery procedures. Female patients accounted for 97% of all abdominoplasties. Most patients were between the ages of 35 and 50 (58%), with patients under 35 accounting for 20% and patients over 50 accounting for 22%. Eighty-two percent of all plastic surgery patients during 2001 were white, 7% were Hispanic, 5% were African American, and 5% were Asian American. Because abdominoplasty is considered to be an elective cosmetic procedure, most insurance policies will not cover the procedure, unless it is being performed for medical reasons (for example, if an abdominal hernia is the cause of the protruding abdomen). A number of fees must be taken into consideration when calculating the total cost of the procedure. Typically, fees include those paid to the surgeon, the anesthesiologist, and the facility where the surgery is performed. If liposuction or breast surgery is to be performed, additional costs may be incurred. The average cost of abdominoplasty is $6,500, but may range from $5,000–9,000, depending on the surgeon and the complexity of the procedure. more rarely, blood pressure problems, allergic reaction, heart attack, or stroke may occur. In most cases, abdominoplasty is successful in providing a trimmer abdominal contour in patients with excess skin and fat and weak abdominal muscles. A number of factors will influence how long the optimal results of abdominoplasty will last, including age, skin elasticity, and physical fitness. Generally, however, good results will be long-lasting if the patient remains in good health, maintains a stable weight, and exercises regularly. One study surveying patient satisfaction following abdominoplasty indicated that 95% felt their symptoms (excess skin and fat) were improved, 86% were satisfied with the results of the surgery, and 86% would recommend the procedure to a friend. The overall rate of complications associated with abdominoplasty is approximately 32%. This percentage, however, is higher among patients who are overweight; one study placed the complication rate among obese patients at 80%. Rates are also higher among patients who smoke or are diabetic. The rate of major complications requiring hospitalization has been reported at 1.4%. Before seeking abdominoplasty, an individual will want to be sure that loose and excess abdominal skin and fat cannot be decreased through a regimen of diet and exercise. Abdominoplasty should not be viewed as an alternative to weight loss. In fact, some doctors would suggest that a patient be no more than 15% over his or her ideal body weight in order to undergo the procedure. Liposuction is a surgical alternative to abdominoplasty. There are several advantages to liposuction. It is less expensive (an average of $2,000 per body area treated compared to $6,500 for abdominoplasty). It also is associated with a faster recovery, a need for less anesthesia, a smaller rate of complications, and significantly smaller incisions. What liposuction cannot do is remove excess skin. Liposuction is a good choice for patients with localized deposits of fat, while abdominoplasty is a better choice for patients with excess abdominal skin and fat. Hensel, J. M., J. A. Lehman, M. P. Tantri, M. G. Parker, D. S. Wagner, and N. S. Topham. "An Outcomes Analysis and Satisfaction Surgery of 199 Consecutive Abdominoplasties." Annals of Plastic Surgery, 46, no. 4 (April 1, 2001): 357–63. Vastine, V. L., et al. "Wound Complications of Abdominoplasty in Obese Patients." Annals of Plastic Surgery, 41, no. 1 (January 1, 1999): 34–9. American Academy of Cosmetic Surgery. 737 N. Michigan Ave., Suite 820, Chicago, IL 60611. (312) 981-6760. http://www.cosmeticsurgery.org . American Board of Plastic Surgery, Inc. 7 Penn Center, Suite 400, 1635 Market St., Philadelphia, PA 19103-2204. (215) 587-9322. http://www.abplsurg.org . American Society of Plastic Surgeons. 444 E. Algonquin Rd., Arlington Heights, IL 60005. (888) 4-PLASTIC. http://www.plasticsurgery.org . "2001 Statistics." American Society of Plastic Surgeons, 2003 [cited April 8, 2003]. http://www.plasticsurgery.org/public_education/2001statistics.cfm . "Abdominoplasty." American Society of Plastic Surgeons, 2003 [cited April 8, 2003]. http://www.plasticsurgery.org/public_education/procedures/Abdominoplasty.cfm . Gallagher, Susan. 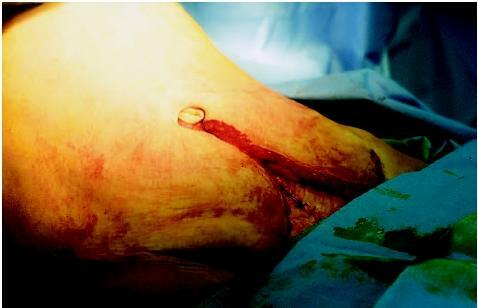 "Panniculectomy: Implications for Care." Perspectives in Nursing, 2003 [cited April 8, 2003]. http://www.perspectivesinnursing.org/v3n3/panniculectomy.html . "Training Requirements." American Board of Plastic Surgery, July 2002 [cited April 8, 2003]. http://www.abplsurg.org/training_requirements.html . "Tummy Tuck." The American Society for Aesthetic Plastic Surgery, 2000 [cited April 8, 2003]. http://www.surgery.org/q1 . Zenn, Michael R. "Breast Reconstruction: TRAM, Unipedicled." eMedicine, December 13, 2001 [cited April 8, 2003]. http://www.emedicine.com/plastic/topic141.htm . Abdominoplasty is usually performed by a plastic surgeon, a medical doctor who has completed specialized training in the repair or reconstruction of physical defects or the cosmetic enhancement of the human body. In order for a plastic surgeon to be considered board certified by the American Board of Plastic Surgery, he or she must meet a set of strict criteria (including a minimum of five years of training in general surgery and plastic surgery) and pass a series of examinations. The procedure may be performed in a hospital operating room or a specialized outpatient surgical facility. How long have you been practicing plastic surgery? Are you certified by the American Board of Plastic Surgeons? How many abdominoplasties have you performed, and how often? How extensive will the post-surgical scars be? What method of anesthesia will be used? Will my insurance pay for part or all of the surgery? Do you provide revision surgery (i.e., if I experience suboptimal results)? I found the information very useful,a great help. The images were also good because they showed you a oval shape being cut from hipbone to hipbone,(most images show one line going from hipbone to hipbone)This made it clearer to me how the operation would be done. I found the article very informative and non biased. I felt I could make and informed decision about the procedure based on the information I received. I was so impressed with this site. It provided answers for most, if not all my concerns. I will be going for the surgery in a couple of weeks and I am frightened but this site provided alot of information. With the knowledge I received, it also provided comfort. If you had a C-section, is a portion of your tummy tuck covered by medical? Is a portion of the tummy tuck covered under medical if you have had 2 c-sections? I am a 47 yr old women in terrific health and fitness. I had a full abdominoplasty three months ago and have numbness to my left outer thigh. Is this normal and can doctors see these nerves when being cut? And will it go back to normal? Thank You! The information were very helpful. I am 5'1" and 143 Ibs. I need lipo suction in love handle area (Flanks), my tummy and also between my legs and my inner knees. Could they do all the areas at one time Anesthesia or not? I am 49 , I has an abdominoplasty done last Monday March 12th. I am from Costa Rica and it was done by one of the best surgeons here Dr. Annabelle Salas Pereira. I feel great, I recommend this surgery to any strong healthy person. No problem at all . Today 10 days after the surgery I feel excellent. It was only the second day when I arrived home from the hospital that I had trouble finding the best position for my body. After that day , each day is a lot better than the day before. I looked in the mirror and I look great ! it's like someone else!! This is the best thing I've ever done ! I am 3 weeks post op now and I feel great. I'm very happy with the results of my surgery and would recommed it to anyone that is healthy and in good shape. I worked really hard at being physically and emotionally strong before my surgery. I felt this was the best way to recover and now I know it was worth it. I can hardly wait to get back to the gym. It was less painful than I thought too, only a little uncomfortable at times, but not painful. Get some good magazines get caught up on your movie watching. Without the help of my family I couldn't have done this. I just had an abdominoplasty 3 weeks ago and am feeling pretty good. I probably have been doing too much but being a mom of a 2 and 5 year old you do. I had two c-sections 8lb 14oz,23 1/2 inches long (two footer!) and a 9lb 6oz, 22 inches long. I gained 60lbs first pregnancy, lost it and then gained 70lbs second pregnancy, lost only 50. With this I had a lot of extra skin that as I lost weight it just hung lower and lower. I stayed at my mother-in-laws for a week while my husband took care of kids and home. I felt it would not be wise to be home with drains where a two year old does not understand and just wants to crawl and jump all over you, or be picked up. I came home after the first week(same day drains were removed)and with my situation of young ones it was difficult because i was advised not to lift anything over 5 pounds for two weeks. I am 3 weeks post op and every day gets better. Still trying not to lift too much. I am returning to work tomorrow which consists of mostly sitting. I would not have put if off for the world. I am very happy with the results and when all the swelling goes down it will be even better. So regardless of all the hurdles it was worth it. If you are waiting for the right time as i was thinking of putting it off for this reason or that, it would never have gotten done. So for once, let it be all about you! You deserve it. I used this site to answer all/most of my questions and after reading and making an educated decision i chose to do it. I Wish you all a speedy recovery! Has anybody had a tummy tuck and a hernia repair and breast implants at the same time? 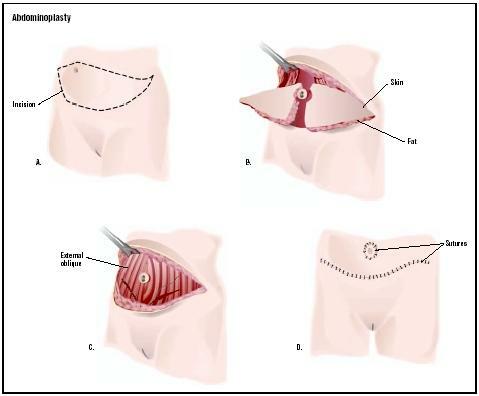 I have had a tummy tuck and due to my heart surgery which left me with no sternum.....the tightness of the tuck is mashing on my diaphram and making it hard to breath.....is there a reversible procedure for the tuck? I found the informatiion very useful. I read this prior to my abdominoplasty and it gave me a detailed picture of what the procedure is. I am now recovering from the surgery...the stitches will be removed in 2 days and I am excited to see my new look. I is a very very good site for Plastic surgeons & patients as well, kindly I want to inform me about the up-to-date informations, please. Hi, I am scheduled for an extended tummy tuck on August 14, 2007. Can someone email me and give me all information. I really would like to talk with someone that has actually gone through with this surgery. I've did extensive research but haven't been able to be in contact with no one that actually had the surgery. Thank you in advance. My email address is Nit2stay@aol.com. I want someone to email me concerning a tummy tuck that has actually had the surgery. Tummy Tuck Club. This has been the best thing I have ever done for MYSELF! I am only 9 days out of surgery... and I feel great! The minor discomfort I feel now only happens at end of the day. I would reccomend this surgery to any healthy person ready to make a life change. Life Change- meaning... eating the right things, exercising and staying positive. It is not easy... but in my experience, anything really worth having rarely is. Good Luck! I found the information on this side very usefull..I copy the answer to ask my Dr at my appoitment.. I had my tummy tuck an lipo suction about 2 months ago an now look and feel great. After the surgery for the intial 2 weeks is the hardest an after that it is all uphill from there. You need help for the first few days. The article was through and true. It gave detailed information but possible should stress the need for help/support after the surgery while you heal. This is a surgery i would strongly recommend. I am 2 weeks and 5 days s/p tummy tuck. I removed my drain after 2weeks due to out put less than 40ml. When I removed drainage tube , approx. 70ml oozzed out. Now my concern is swelling above drain site, feels muuching to palpation and noticable swelling. My surgery was down south of the border and I would rather not travel to be check, unless necessary. Will my system remove on its own or will I require I & D?